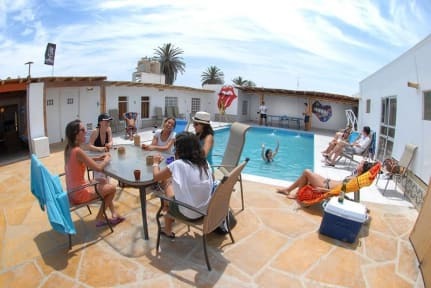 Beach Front Hostel & Bar with Top Quality Accommodation: Private Rooms, Private Pods in Dorms, Pool, Kayaks, Stand Up Paddles & more. Paracas has mostly sunny days, it's one of the Top Kitesurfing destinations & also has a couple of surf spots. We can also book you the Ballestas Islands Tour and National Reserve Tour at cheap prices. Great discounts on Kitesurfing lessons with Peru Kite, the best Peruvian Kitesurfing School. - 24 hrs. hot water. - Lockers provided in our dorm rooms. - Spotless rooms, bathrooms and common areas. - Hobiecat Catamaran Trips on the bay. Cancellations with at least 24 hrs. before arrival date. Cash, Credit cards and debit cards (Visa) accepted on arrival. IGV - Sales tax applies for peruvians or foreigners with more than 60 days in the country. Please note minors are only allowed under previous coordination. A super nice hostel. There's a nice swimming pool in the middle of the Hostel. The staff very nice that can help you anytime. An excellent breakfast. The only point that I consider is about the security. You can put your bag in the luggage store but it there is not a good control because anyone can get a random bag, well there's a responsible person that take care it but I think If there was a control by tickets It would be better. Amazing capsule-style dorm beds, clean hostel and nice common areas (pool+bar). Cons: breakfast is your average peruvian breakfast, so only bread+butter+jam and reception seemed a bit understaffed. O staff é incrível, muito amigáveis e atenciosos! O ambiente é ótimo, com espaços comuns bem legais e um bom bar. Só não gostei que meu quarto não tinha como ser trancado, então você tinha que colocar todas as suas coisas no armário mesmo porque qualquer outro hóspede poderia entrar, já que não tem chave. Também não gostei que o banheiro com chuveiros era unissex e não tinha lugar para apoiar as coisas/se trocar depois do banho. Contudo é bom, banho quente e cama confortável! As festas da sexta não permitem que os hóspedes cansados possam descansar. O rapaz da recepção que usa óculos atende muito mal, em compensação o Gufi e o Jose foram magníficos. Hostel animado e bem localizado!